RISE is a figure skating movie that honors and remembers the tragic plane crash that killed all the members of the 1961 U.S. Figure Skating Team. In memory of the skaters that lost their lives, US Figure Skating set up the Memorial Fund. The Memorial Fund has made it possible for many, many figure skaters to fulfill their ice skating dreams. "Can the end of one dream give rise to another?" is RISE's message. 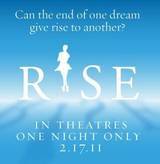 Peggy Fleming, Dorothy Hamill, Scott Hamilton, Brian Boitano and Michelle Kwan serve as storytellers in RISE. The five legendary skaters provide the narrative for the cinematic feature by relating the interwoven stories of some of the biggest names and moments in the history of the sport to those on the 1961 U.S. World Team who lost their lives in the crash of Sabena Airlines Flight 548 on its way to the World Championships in Prague, Czechoslovakia. The most significant and perhaps controversal of the changes deals with under-rotated jumps. Some 170 participants from 54 countries participated in the juniors World Championships. The 2012 World Junior Figure Skating Championships will be the World Junior Figure Skating Championships for the 2011–2012 figure skating season. Commonly called "World Juniors" and "Junior Worlds", they are an annual figure skating competition in which elite figure skaters compete for the title of World Junior Champion. The event will crown the World Junior Champions in the disciplines of men's singles, ladies singles, pair skating, and ice dancing. The event has been provisionally assigned to be held in Minsk, Belarus from 27 February to 4 March 2012. How can you get started figure skating? If you have never skated before you should probably start with a public skate at a local rink. You may want to take some lessons and it is best to start with group lessons which are offered at every skating rink. 12 U.S. Olympic Champions to Attend 2010 AT&T U.S. Figure Skating Championships in Spokane, Wash. Reigning World Champion Yu-Na Kim (KOR) skated to the gold in the Ladies event and recaptured the title she had lost last year to Mao Asada (JPN). Miki Ando (JPN) earned the silver, her first medal in what was her fifth appearance in the Grand Prix Final. Reigning World Champion Evan Lysacek (USA) took his first Grand Prix Final title. The American produced a sophisticated program to “Sheherazade” and reeled off eight triple jumps, including two triple-triple combinations and also showed strong spins and footwork. Xue Shen/Hongbo Zhao (CHN) continued their successful comeback with their third gold medal in as many competitions. They also took the sixth Grand Prix Final gold medal of their career. Michelle Kwan will beinducted into the Figure Skating Hall of Fame on January 27, 2012. To purchase tickets tothe event click here. United States Figure Skating has restructured the Moves in the Field program and tests. Skaters and parents of skaters frantically wondered if they should try to test all the way from Pre-Juvenile level all the way through Senior within the next year in order to avoid the changes. The fact is that the changes are for the better and there is no need to hurry up and test. The 2012 US Nationals Will be held January 22-29, 2012 in San Jose California. With the Olympics coming up in 2010, skaters are making coaching changes to get a competitive edge. I can understand how a different approach may be beneficial but I imagine it must be a very difficult decision, The risk of moving to someone who has a different approach to skating is quite high with only 9 months until the olympics. Mirai Nagasu the 2008 U.S. figure skating champion announced she will now train with Frank Carroll, coach of reigning men's world champion Evan Lysacek. Nagasu had worked with a team of coaches, with Charlene Wong having the main duties, since October 2006. Caroline Zhang is already familiar with her new coach. Caroline announced she is ending her four-year partnership with Li Mingzhu and will now train with Charlene Wong. Wong most recently coached Mirai Nagasu, Zhang's close friend and main rival. Reigning two-time US pairs figure skating champions Keauna McLaughlin and Rockne Brubaker will switch coaches to work with John Nicks ahead of the 2010 Winter Olympics. How did Evan Lysacek surpass Evgeni Plushenko to capture the gold medal. I mean c'mon Evgeni did a Quad! Was it Evan's artistry? Was it his choreography?, Was it his footwork? You may be surprised at the reason. Weather you are a beginning skater and are looking to learn how to skate, an advanced skater, a parent, or a coach, you will find a lot of useful figure skating information on GoFigureSkating.com. You can learn a lot about skating from our pages on figure skating skills, test requirements, participating in figure skating competitions. The site includes pictures and videos that demonstrate various figure skating skills. If you are just getting started with skating you will want to check out our introduction to figure skating pages. You will also need to know about figure skating training. Our figure skating skills section includes information on figure skating jumps, figure skating spins, spirals, and more. Figure skating is a great sport. Figure skating builds self esteem. Why do figure skaters have great figures? This web site is the best place to start learning about figure skating. Most every ice rink has a learn to skate program. Check back often because we are continually updating this site with the latest information on figure skating. Click here to find an ice rink near you. Find an ice rink near you.